The Sakata ball tournament sponsored by Safaricom has become the most popular grassroots tournament in Kenya. Over the past 3 years, tens of thousands of Kenyan youth were given a chance to showcase their skills and otherwise just keep themselves busy and engaged in health activity. This all ended in 2012. This years Sakata ball tournament has been cancelled. The reason is that Sam Nyamweya, Elly Mukolwe and other FKF leaders have demanded that every party that sponsors a football tournament in Kenya, must deposit the equivalent of 20% of the total sponsorship package with FKF. Since Safaricom planned to sponsor this years tournament to the tune of ksh 75 million, this would mean depositing ksh 15 million with Nyamweya Mukolwe and co. Thats a healthy amount by any standard. A letter from Mr. Nyamweya to Safaricom stated hence “Football Kenya Federation, the body mandated by FIFA to manage football activities in the country, “Our Federation after assuming office, noted with concern that there were numerous unsanctioned tournaments being organised by individuals and firms without the Federation’s approval. It was then resolved by the Federation’s National Executive Committee that all youth organised tournaments must be sanctioned and regulated and also played in a league format. It was resolved that the Federation will issue guidelines on the rules and regulations of the leagues and tournaments on behalf of the sponsor. Football Kenya Federation, owning the rights of the game, will receive a payment of 20 percent from sponsoring deals as administration fees, this will enable logistics such as organising the game in the frame work within their sub branches and providing qualified match officials as well as other technical related issues. The idea that Nyamweya wants to streamline and organize Sakata ball, a tournament that has run succesfully for 3 years is quite frankly laughable. In fact anything organized by FKF is likely to be mired in controversy, corruption and poor organization. Take the Kenya premier league for example. When it was run by the then national body KFF, of which Nyamweya was a member, it was dead and moribund, unable to attract any sponsors or broadcasting partners. It is only now that KPL has divorced itself from KFF/FKL that the crowds are returning due to the fact that it is well run and is generally free of infighting and wrangling. The moment FKF takes over Sakata ball, it will deteriorate. Where is the Accountability ? Safaricom and Kenyans in general would feel comfortable if FKF had a reputation of accounting for every penny that comes into its coffers. However quite the opposite is true of Nyamweya. The money will likely end up in the bank accounts of FKF officiials. Nyamweya will stash a significant amount in his personal bank account and then share the rest amongst FKF officials to assure their support and votes at the next election. If Safaricom were to simply give FKF the ksh 75 million without asking for accountability, it would be an irresponsible act on their part. It would be tantamount to aiding and abetting corruption. No responsible corporate entity should be that irresponsible. Remember the Motokura Cup ? In 1985, a Japanese businessman named Yaushiro Motokura arrived in Kenya and indicated that he was interested in enhancing the standards of football in Kenya. He did this by establishing the annual Motokura cup. 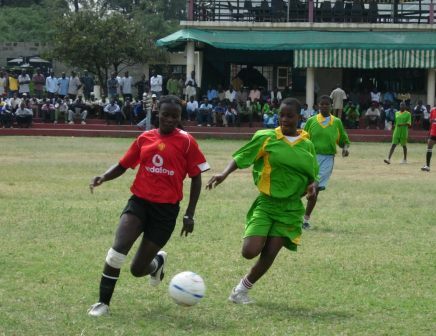 The tournament featured the top 4 teams in Kenya playing against top tier teams from Germany and Asia. The 1985 edition had FC Seraing and FC Den Bosch. Both teams were in the top tier leagues of Belgium and Netherlands respectively. The 1985 edition was won by Honda FC of Japan. The beat Gor Mahia on penalties after a 2-2 draw. The tournament was an excellent opportunity of Kenyan players tpo raise their standards by playing against top teams from overseas. It also presented an opportunity to catch the eyes of foreign scouts. Alas Mr. Motokura left in a huff. A KFF official was quoted in the press as saying: “Mr. Motokura should stop meddling in Kenya football”. What likely happened was that the official demanded a cut from Motokura which Motokura denied. Motokura was this forced to leave the country and kenyans were yet again the loosers, missing out on a chance to watch top class football and see the standards of football in the country rise. And this my friends is the reason Kenya football continues to be mired in a sewer of low standards. Our officials are selfish, self centered and care nothing about raising the standards of football. Nyamweya has been a charlatan for years even pocketing transfer fees of players. Yet he soundly won the election. That says alot about the delegates who voted for him. Where does safaricom go from here ? First off I am not sure I understand why Safaricom needs the blessings of FKF from running what is essentially a private football tournament. If it is a question of getting qualified referees then I can confidently say that they can hire interested youth from the grassroots, train them for a few weeks and turn them into decent referees. If they can no longer sponsor grassroots football, perhaps Safaricom can turn to other sports. Basketball and volleyball are excellent candidates for a grassroots tournament. Giving Mr. Nyamweya and FKF money without requesting accountability is tantamount to abetting corruptuion and is the reason the standards of football in Kenya remain forever poor. Corporate entities should do their part to enhance transparency.